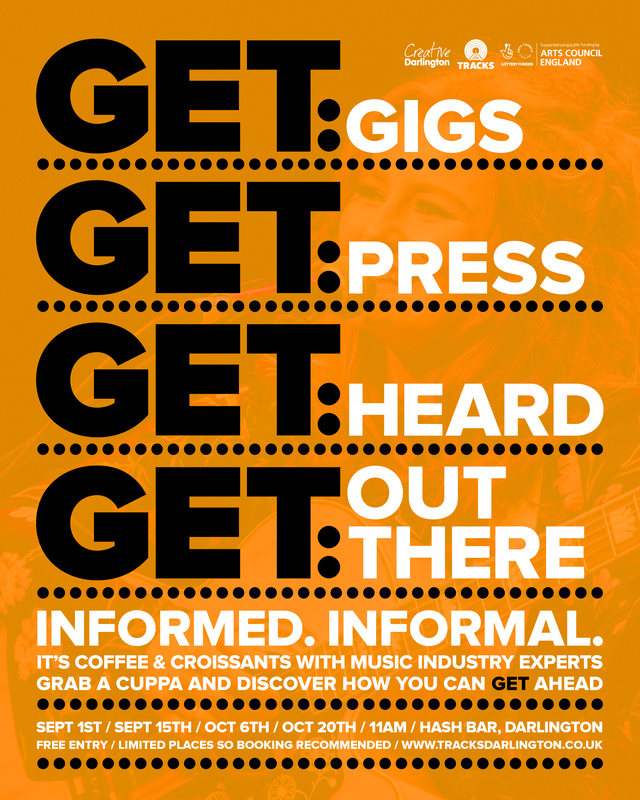 It's coffee & croissants with music industry experts. We proudly present a series of industry advice sessions, covering a range of themes, each featuring a pair of handpicked music biz boffins ready to share their knowledge and help local musicians, songwriters and businesses hit the next level. They're designed to be really informal, with attendees sharing a table with an industry pro at its chair, accompanied by free tea, coffee & pastries. Participants are encouraged to discuss the topic at ease and ask any questions they desire, so that the experience can be as personally tailored and beneficial as possible. The events will take place on 1st Sept, 15th Sept, 6th Oct & 20th Oct, each beginning at 11am, over at the wonderful Hash Bar & Kitchen in Darlington. Want to get your band a bit of media attention? Want to know what to look for in a PR agency? Want an snazzy looking press release? Want to do your own DIY PR campaign?... Whatever you want to know, our informal and informed music industry talks are designed for you to tailor the discussion to get the information you need. The event is FREE and the good people at Hash Bar and Kitchen will be providing FREE hot drinks, pastries and toast. Places are limited so booking is advised (ticket link above). Matty has worked at Super Cat PR for over two years now, splitting his time between their Newcastle and London offices whilst building the company in the north. Having graduated from Newcastle University in 2013 after playing an active role in the student media (The Courier and Newcastle Student Radio), he spent six months interning at Generator, the UK’s leading music development agency, co-organising their annual new music festival Evolution Emerging. Starting full-time at Super Cat in 2015, Matty has since planned and executed online PR campaigns for emerging acts that make sense in the modern music industry. As well as being co-editor for Generator’s Tipping Point blog, he has also promoted multiple gigs and written for blogs in the past, gaining various perspectives on the most effective ways to get your sounds and story out there. Claire Dupree is the editor of NARC. magazine, which she established in 2006 to help promote the North East music scene. 12 years on, NARC. has become the foremost magazine for alternative music and culture in the region, with a dedicated audience and a fast expanding presence. Claire runs live events, including stages at festivals like Stockton Calling, Twisterella and Last Train Home, as well as the annual NARC. Fest, she also does freelance work for other publications, and runs seminars and workshops for musicians and writers. Want to get some gigs? Want to impress a promoter? Want a booking agent? Want to put on your own show? Whatever you want to know, our informal and informed music industry talks are designed for you to tailor the discussion to get the information you need. Chris Cobain has been at the Tees Music Alliance for 10 years. He is currently their programming and production manager and in that role he has booked and promoted shows in the 300 capacity venue The Georgian Theatre, Stockton as well as developing a second venue, The Green Room, Stockton. He is also one of the main organisers/bookers of the successful Stockton Calling festival, which is approaching its tenth year. Graham Iain Clews is a Booking Agent based in Glasgow, Scotland. He started “The Alexia Agency” in early 2011 as a means to get tours for his friends' bands that he managed. However, very quickly tour booking turned into his main focus. Fast forward to 2018, The Alexia Agency is an Internationally known worldwide tour booking agency. Graham Iain Clews remains the only booking agent operating under the brand. Want to record your music? Want to find a producer? Want to know what to do with your music? Want a publishing deal? Want to get your music synced? Whatever you want to know, our informal and informed music industry talks are designed for you to tailor the discussion to get the information you need. John Esplen is the managing director of Wipe Out Music Publishing which was founded in 1996 and is based in Newcastle-upon-Tyne. The company represents many internationally successful artists such as: Sleaford Mods, Stone Foundation, The Spitfires and Warm Digits as well as local artists including: Avalanche Party, Mouses, Elaine Palmer, Be Quiet! Shout Loud and Holy Moly & The Crackers. Andrew Archer has vast experience, gained over 20 years and covering many aspects of the fast-moving and ever-changing music business. If you are interested in production, publishing, working with record labels, working in event and tour management, how to get your music used in films, adverts and video, or in recording your music, talking to Andrew will provide valuable insights into taking your career forward in the contemporary music business. · a sync licensing agency - Loft Music creates and licenses music to some of the world's leading entertainment brands, including Sony, EA Sports and CBS Television for titles such as Gran Turismo, CSI: New York and SSX Tricky. · a record label, Global Underground, where Andrew is now Label Manager and runs the label, roles include licensing, royalty accounting, artist liaison, manufacturing, distribution, D2C sales, social media management, tour support. Want a good release strategy? Want to get organised? Want to go to the next level? Want to know what labels are looking for?... Whatever you want to know, our informal and informed music industry talks are designed for you to tailor the discussion to get the information you need. Henry Carden has over a decade’s experience working within the music industry in a variety of different roles including musician, songwriter, manager, press officer, record label A & R and promoter. Currently, he manages Cape Cub and Cattle & Cane, as well as co-promoting Middlesbrough’s multi-venue music festival Twisterella. As a manager, Henry has excelled in areas including streaming, fan funding, social media and campaign management.